Colin Anthony Doyle (born June 12, 1985 in Cork, Ireland) is an Irish footballer, who is currently Birmingham City's number 1 goalkeeper. Having signed a professional contract with Birmingham as an 18 year old, he has had loan spells at Chester City and Nottingham Forest, during neither of which he saw much first-team action. His first competitive match in English football was a 1-0 win for Chester against Rochdale on November 2, 2004 in the LDV Vans Trophy. He played his schoolboy football in Ireland with Douglas Hall in Cork from Under 8 up to Under 15, when he joined Birmingham City. He has progressed through the Birmingham ranks and made his competitive debut against Shrewsbury in the 2006/07 Carling Cup, keeping a clean sheet in the 1-0 win. He followed up this appearance with his League debut against Cardiff City, where the Blues lost 2-0. 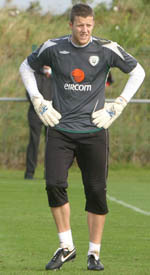 In August 2006, he played against Greece away for Ireland Under 21s and kept a clean sheet in a 2-0 victory. Games in which Colin Doyle was a Substitute.